Performance Time: Approximately 30-45 minutes, 40 pgs. FARCE. Yearning for adventure, Buzz and Hank are mysteriously transported to the Yukon town of Quagmire (pop. 57, temp. 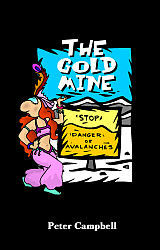 -40°) where they join forces with two dance hall singers to locate a missing gold prospector. However, the only clue they have is in the form of a riddle: “Where sits the black-feathered Goop on the bough of a kinkajou tree, a star will align a path to the mine for those with patience to see.” After seeking the help a mysterious Eskimo woman, they learn that the only kinkajou tree in the Yukon is located in avalanche territory. But before they can reach the site, the greedy mayor of Quagmire and his henchmen abduct the foursome, hoping to find the mine and keep the gold for themselves. But with the help of a Turkish belly dancer and an invisible grasshopper, the foursome manage to foil their captors only to suffer an avalanche and a serious case of snow blindness! This hysterical farce features a simple set, a host of quirky characters, and nonstop laughs. Peter Campbell has written several plays, some of which have been performed in professional theatres. Mr. Campbell attended Pennsylvania State University and Syracuse University and has worked as a newspaper reporter, magazine editor, and speechwriter. He is a member of the Dramatists Guild of America.